This quality cap features the team's official logo embroidered on the front, sponsor logo on the left side, and the Nippon Professional Baseball tag on the back. Exactly what the players wear on the field at their home ground of Koshien Stadium. Exactly what the players wear at Koshien! Our replica caps are popular, but this is the real deal. 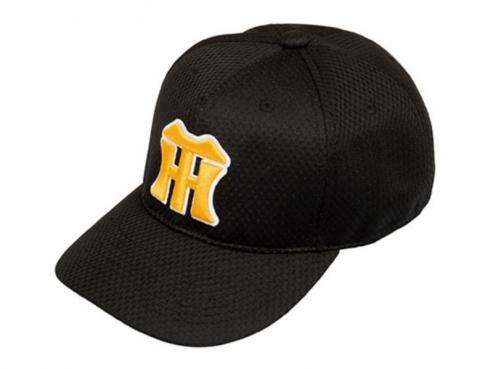 This is an authentic "pro model" fitted home cap for the Hanshin Tigers, the No.1 team in western Japan. The Tigers, based at the legendary Koshien Stadium, have the most fanatical baseball fans in all of Japan. This quality cap features the team's official logo embroidered on the front, sponsor logo on the left side, and the Nippon Professional Baseball tag on the back. Exactly what the players wear on the field. Size: 55cm-62cm. See our size chart to compare to US cap sizes - but it's probably better to actually measure your cap size in centimeters. IMPORTANT: This item is available only on a "made to order" basis. Items will be delivered 2 months or more after an order is placed. This is the system in Japan for this item and there is nothing we at Japan Store can do to speed up the delivery process. As with all pro model items, we cannot accept cancellations or returns.